What is the cause possibilities of uneven wear or abnormal wear on tire? Vehicle mechanical problem due to suspension system, braking system, axle, alignment, etc. Unbalanced tire/wheel assembly and / or other probleem due to non-uniformity Of tire / wheel assembly. Bad / Rough driving style and habits. What Should I do If my tire vehicle runs to one side direction? Many factors can affect when our vehicle is pulling to one side, we need to do the Wheel Alignment Setting to fix pulling tire. But if the suspension components is already worn it will not help much. Check the air pressure (difference air pressure will affect to pulling to one side). What Should I do If I notice vibrate? Vibration appears on the car are indicated that the car needs extra attention. It can lead from the tire (uneven wear), abnormal braking system, abnormal steering system, and component suspension weak. Vibration could cause excessive tire and vehicle suspension weak. What is the cause of my tires became noisy when running in roads condition ? We suggest that your car have inspected by trusted workshop. How can I read my tire size? The 265 indicates this tire is 265 millimeters across from the widest point of its outer sidewall to the widest point of its inner sidewall when mounted and measured on a specified width wheel. The 70 indicates that this tire size's sidewall height (from rim to tread) is 70% of its section width. 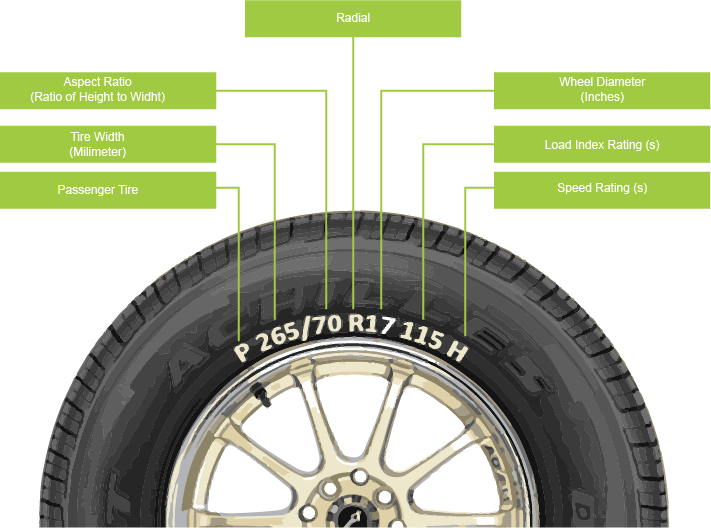 The measurement is the tire's section height, and also referred to as the tire's series, profile or aspect ratio. The higher the number, the taller the sidewall; the lower the number (e.g 45), the lower the sidewall. A letter "R" identifies that the tire has a Radial construction in which the tire's body plies "radiate" out from the imaginary center of the wheel. The 17 indicates the tire and wheel diameter designed to be matched together. The number "115" indicates The load capacity of a tire determines what weight each tire is able to carry. this number shown the weight capability's of tire to carry is 1.215 kg. 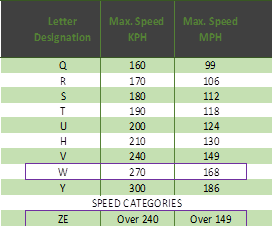 The letter "H" identifies Speed rating which indicated the maximum recommend speed of the tire. in this case the maximum recommended is 210 km/hours. How do I know whether the size of my tire is appropriate with my vehicle? Tires is a vital part of vehicle, therefore you must be careful when you Choose tires which appropriate with the specifications and vehicle designation. Carefully when you read the tires code on your vehicle, if you read through, then you have made the first step in safety driving, to know how is your tire used if it is Appropriate to the type of vehicle, you can see from the Recommendations of the vehicle book manual owner, or you may also find a tire fit guide in these locations: The driver’s side door jamb, Inside your glove box door, or Within your gas tank hatch. What does speed rating mean and how do I know the correct one for my vehicle? Speed rating means indicated the maximum recommend speed of the tire. The speed rating shows on the sidewall. Ex: speed rating “W” used to represent a maximum of 168 mph (270 kph). It’s critical that your performance rating and load index matches the original equipment specifications recommended by your vehicle manufacturer. You can always go up in performance rating, but you can never downgrade or you’ll compromise the handling and safety of your vehicle. When you choose "recommended" you will see the speed rating appropriate for your vehicle. Numbers in parentheses indicate quantity. 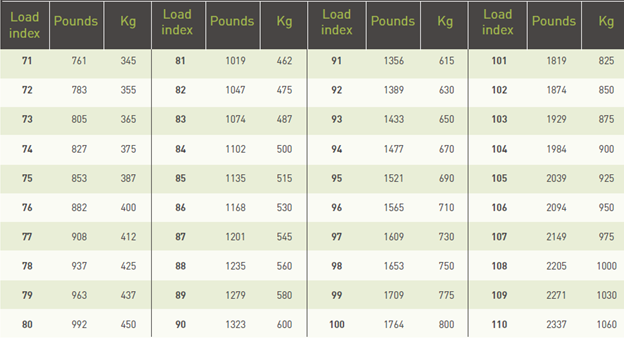 What is the correct load index for my vehicle? How can I know if my tires are directional and properly mounted/rotated? Tire tread pattern for directional and asymmetrical have some rules of each mounting. Directional tire have arrow on the sidewall and usually marked with an arrow-shaped and written with "Rotation", while asymmetrical are those that the tread pattern on one side is different than the other side. They will always have something on the sidewall that says "THIS SIDE OUT" - or 'outside‘/’inside'. To Determine the direction of rotation are directional and properly mounted, you can see the sidewall of your tire, towards which arrow labeled "ROTATION" for the type of directional tire or label "OUTSIDE" for the type of tire asymmetrical, if the arrow pointing forward "rotation" or "Outside" in position pointed out then the tire properly mounted, but if the otherwise then the mounted is incorrect. If you selected directional tires and/or asymmetric tires, before installing them, match each tire and wheel to its final position on your vehicle. There are several tips when we should change our tire immediately. 1. the first step is measured the remaining groove depth tire, if the remaining groove depth is less than 1.6 mm then you have to replace the tire. 2. second step is to inspect the tire whether the tire have a crack on the sidewall. 3. check the tire whether it have a swollen tire on the tread area or on the sidewall. 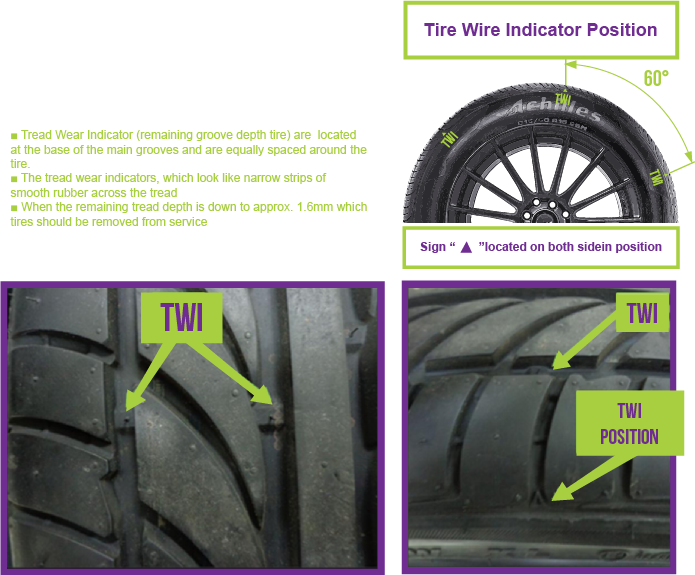 4. last step is check the tread wear indicator on the tread area, Tread wear indicators - Cross ribs evenly spaced around the circumference of the tire in the main longitudinal tread grooves which become level with the tread surface when the remaining tread depth is down to approx. 1.6mm. Remaining Groove depth 1.6 mm is the most widely accepted minimum tread depth standard at which tires should be removed from service. Can I mix my tire with other brand or pattern ? For best performance we recommend you to use the same size, brand and pattern. If the tires brand and pattern are different, it will be affect to performance, handling and stability. Can I change my tires with plus sizing? Plus sizing wheels and tires is a popular trend among car enthusiasts. Adding inches to the wheel diameter for wider, low aspect ratio tires can increase your car’s performance capabilities including handling and stability. Some people will also plus size for the appearance. be sure to check vehicle manufacturer’s recommendations (found in owner’s manual or on door sticker). Interchangeability is not always possible because of difference in load ratings, tire dimensions, wheel well clearance and rim size. Can my tires damage include in warranty ? We need to analyze further the tire damages and for the accurate analysis, our Team Achilles need to do a physical check of claim tire as the basis for a decision of tire claim. Our standard procedure for claim tire Achilles is you can send your tire to the dealer or retailer which you bought and then the dealer or retailer will submitted the tire claim to our Distributor's, and we will check the tire claims for further inspection and to Determine if warranty Applies coverage (the claim will be processed via our distributor and the tire will be sent to our factory for analysis). Is my burst tire include in warranty? Our warranty covers defects in workmanship and materials in this case is the damage caused due to manufacturer's defective. We do not cover tires for the damages tire due to improper usage will not be acceptable for compensation such as damaged by road hazards, accidents, corrosions, cuts or damaged caused by nature, tire intentionally damage or added with new defect (submitted at non-good will), vulcanized or repaired tire, etc. How is Procedure claim tire Achilles? 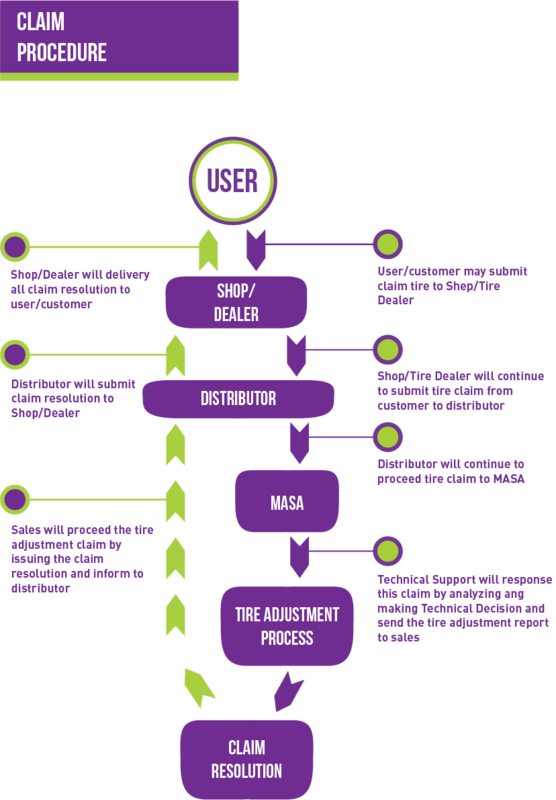 Our standard procedure for claim tire Achilles is customer can send the tire to the dealer or retailer which customer purchased, you may have the dealer properly inspect the tire or tell the tire dealer what you are experiencing so they can diagnose the problem, and the dealer or retailer will submitted the tire claim to our Distributor's. The claim will be processed via our distributor and the tire will be sent to our factory for analysis further inspection and to Determine if warranty Applies coverage. If theres any questions please have them call us while you are there. Where can I Find a Achilles Tire Product? Where can I get the Achilles price? Where do I find any product promotion info from Achilles? Where do I find about Achilles upcoming events? How can I subscribe to Achilles latest promo? How can I submit an event partnership proposal? Who Do I Contact about Careers with Achilles? We are always looking for new employees who will become part of the success of our company. Please visit our website : www.multistrada.co.id/career to view our Current Job Openings and apply online today!